Mmmm... When you think of something tangy, sweet, and juicy, what comes to mind? Berries! Oodles and oodles of fresh picked berries topped over cheesecake with a little whipped cream, mixed in with a fresh fruit salad, draped over a cool bowl of icecream, or sprinkled with a touch of sugar. Mmmm... anyone hungry? Montana has a wide variety of berries: huckleberries, blackberries, raspberries, and strawberries. Where, you might ask, do you get all these berries, and what exactly do they look like? You can buy berries from a variety of personal dealers or from the grocery store, but if you want the full experience of picking them yourself, you're going to have to do a little hiking. The great thing is that berries are usually found on Federal and State Lands, like Glacier National Park, so the day is generally a fun filled family adventure. Just be careful of the bears! They like berries too. When berry picking or shopping always look for berries that are plump and rich in color. Did you know that the Indians used berries as dyes because of their bright colors? They also used the berries as food and medicine. Huckleberries, blackberries, and raspberries grow on bushes. 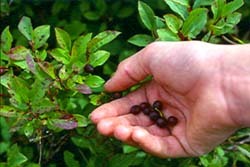 Huckleberries are deep blue to black in color and have a smooth skin. Blackberries are black with a textured skin. Raspberries are a soft to deep maroon color and they too have a textured skin. Strawberries are a bit different in that they grow near the ground. They are usually a bright red color with green leafy tops and they have a textured skin. Berries are not only good to eat, but they are also good for you! They provide your body with an excellent source of vitamin A and vitamin C. In fact, they are so good for you that you can have them three or four times a week, well . . . as long as the bears don't eat them all! Berries are used for a wide variety of things. Many Montana businesses were started specifically to create a variety of berry products. These businesses place a well-known Made in Montana sticker on their products. 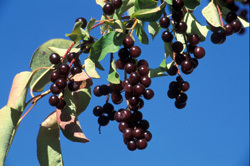 Montana takes great pride in the excellent products that are produced using native berries. Some businesses use berries to make deserts like milkshakes, candy, pies, and puddings. Other businesses make beauty products like lotion, soap, and shampoo. What other products do you think are made with berries? I'll give you a hint: jam, honey, syrup, hot cereal, muffins, and many other eatable and noneatable products. Beat 1/2 cup butter or margarine in large bowl until creamy; add 1 cup white sugar and beat until fluffy. Beat in egg yolks and vanilla until light and creamy. Add sifted dry ingredients alternately with the milk. Fold in beaten egg whites. Fold in the fresh berries. Shake a little of the dry ingredients over the berries, before adding them to the mix so the berries won't sink to the bottom. Turn into a greased 8 by 8-inch pan. Sprinkle top of the batter lightly with granulated sugar. Bake at 350 degrees for 50-60 minutes. Visit montanakids.com's Activities and Games section for more Montana recipes.